An easy recipe for super chewy, soft, and perfect chocolate chip cookies. There are literally hundreds of chocolate chip cookie recipes out there and everyone has their favourite! This recipe I’m about to share really stands out though for baking the chewiest of the chewy, the softest of the soft buttery cookies! The dough has a centre that has that slightly under-baked texture (it isn’t though) and the edges have a beautiful chewy and moreish taste. This recipe is quite standard but I think the ratio’s are what make it slightly different. I do cream the butter and sugar, but I use the butter far softer than I normally would. In fact it works better if you blast it for 10-15 seconds in the microwave just so it reaches that stage where its about to melt completely. Don’t worry though, the quantity of flour used ensures that the melted butter doesn’t bake greasy. I used my mixer for this recipe, but its perfectly fine to mix by hand too. 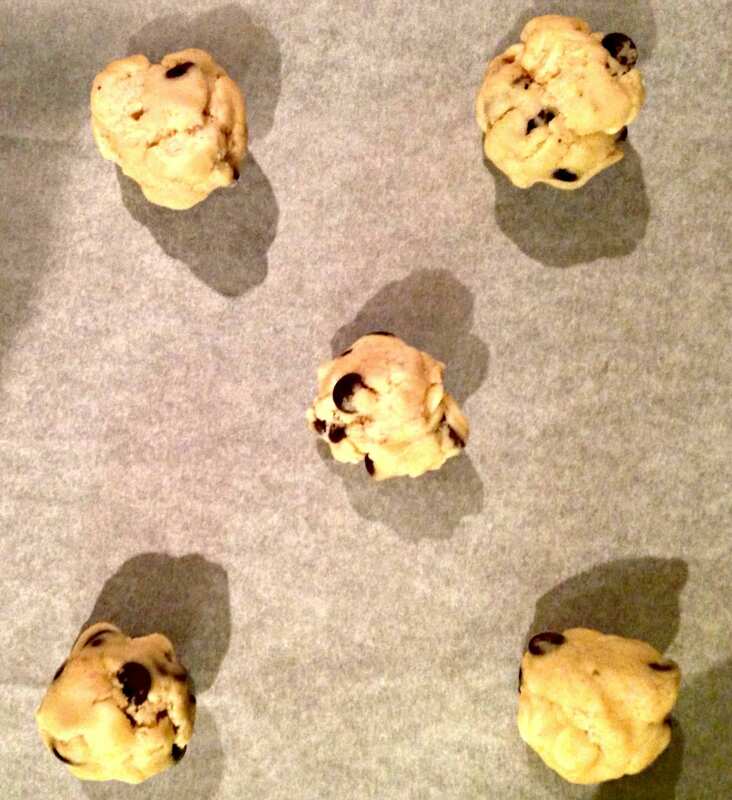 One VERY important point is that you must fridge the cookie dough – I can’t stress this step enough. Chilling the dough allows the ingredients to settle together and the longer it’s chilled the thicker your cookies will be. I made two batches from this recipe (around 18 cookies) and the first was made after being chilled for 6 hours, the second batch for 3 days! You can actually freeze the dough and cook from frozen too, just add an extra minute on your cooking time. A tip I’ve just thought of is that you could actually freeze the dough in it’s rolled balls, then just take one or two… or maybe three if you’re like me… out the freezer when you need a quick cookie fix! When you remove the cookie dough from the fridge it will be quite crumbly, but it will roll together easily from the warmth of your hands. I mentioned previously that this recipe will make 18 cookies but what I forgot to say, and I think it’s pretty vital – these cookies are large! I mean who wants a tiny cookie anyway? Monster cookies all the way I say. They will spread as they bake so make sure you space them well. Each rolled ball is about a golf ball size… and try to get them taller rather than wide too, they don’t have to be perfectly round. These cookies take around 12 minutes to bake. They will come out very soft, but don’t panic they are baked, they actually carry on baking for around 8 minutes once removed.. clever little cookies they are 😉 So, whatever you do, don’t over bake. Oh, and if you did want smaller cookies then don’t forget to reduce the baking time too. Enjoy! Please do let me know if you use this recipe, all feedback is appreciated. I’m sure these would fit well into my January detox! Thank you for sharing this recipe. We baked these cookies today, and they were so delicious – we couldn’t stop eating them! And they really are super easy to make! I really admire your blog, Natalie. I’m going to be trying your Chocolate Chip Banana Bread recipe at the weekend – it sounds so tasty, and again, really easy to make!